I am a great Balika Vadhu fan. My husband often teases me about my fondness of watching Balika Vadhu the craze of which didn't diminish an iota even after coming here. I am not hooked on to any other daily soap except this one. I remember once I used to watch Uttaran which came on air about at the same time as Balika Vadhu, but after one or 2 years of watching Uttaran, I just felt I have had enough entertained myself with illusory fabled stuff that the serial was showcasing with one character murdered in broad daylight and then reappearing the next day in his spitting image ('hamshakal'). But Balika Vadhu is different. The story though based on a regressive custom of child marriage has shown progress in the lead characters moving on with their lives without any futile attempt being made to establish illogical or irrelevant connection of events. The story has matured over time showing the protagonist picking up the pieces of her life and move on. After all, a failed marriage should not end a woman's life pushing her into an eternal darkness. Hailing from a literature background, I have known that any piece of art is a reproduction of life. Hence any story represented in action on big or small screen should not stretch to the extent of incredulity that the audience fails to connect after some time. The good thing about Balika Vadhu is every character seems alive in flesh and blood without getting overboard with the positive and negatives shades of their essence. They resemble so much the people we interact with daily or have come across in our lives. That is the beauty of this serial which glues me on to it. Coming back to the recipe, I have cooked chana masala many a time with tamarind pulp, but first time with kokum. The idea of cooking it with kokum came along the day I cooked Toor Dal with Kokum. Kokum has a mild flavour of tanginess that never feels sharp on your tongue. For people who don't like the taste of tamarind may find kokum a good substitute. 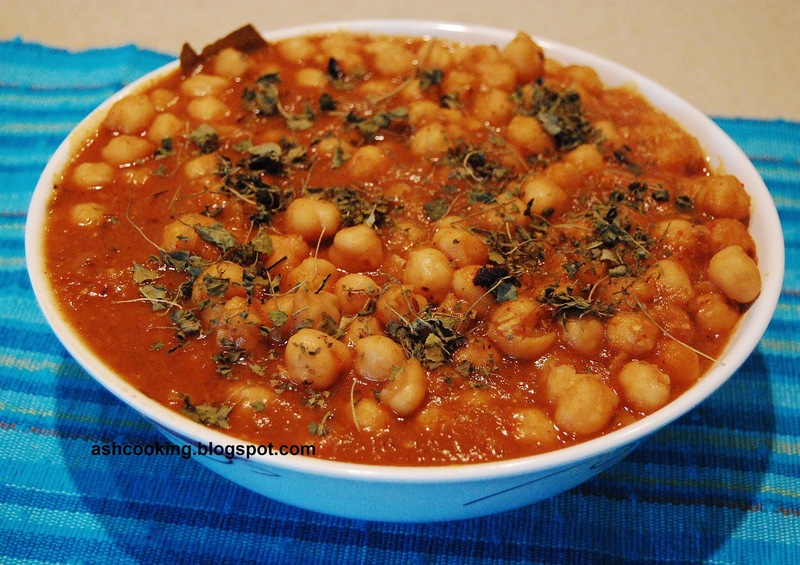 1) Soak kabuli chana overnight for at least 6 hours. Then put them in a pressure cooker immersed in 2-3 cups of water along with butter, turmeric powder and kokums. Cook up to 8 whistles. (Yes heard right, 8 whistles. Kabuli chana is strong enough to withstand that, believe me :p). 2) Grind onion, tomato and green chillies into smooth paste. 3) Heat oil in a wok. Add cumin seeds when oil turns piping hot. Allow them to crackle. 4) Add the onion-tomato paste and cook till the water content from the mixture evaporates. 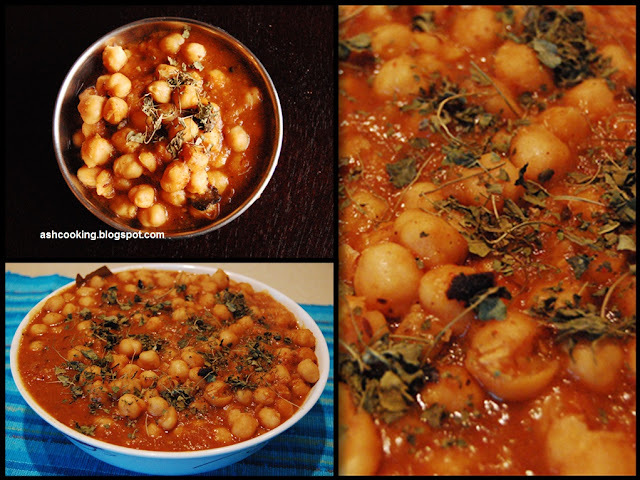 5) Add ginger-garlic paste, cumin powder, coriander powder, kashmiri red mirch, dry mango powder and Everest chana masala. Sauté till oil leaves the sides. 6) Pour the dal in. Cook for some time till the gravy thickens. 7) Add salt and sugar. Cook for 2 minutes more. 8) Before turning off the heat, add garam masala powder and drizzle ghee, if using, over the curry. Gently stir once to fold in. 9) Once the flame is turned off, sprinkle kasuri methi and keep the curry covered for 5 minutes till it steeps in a beautiful aroma. 10) Serve hot with chapati, paratha or puri.